My daughter, Shantel, and I met with an advisement counselor this morning at her college to make sure Shantel is on track to graduate with her Associate In Arts (AA) degree in May. Good news!!! Shantel is completely on track. YEAH!!! 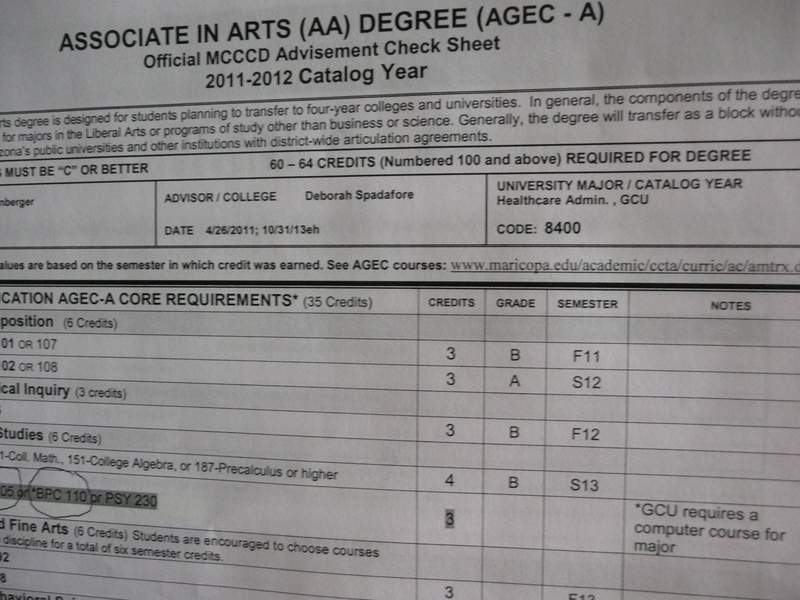 Shantel has worked very hard, and is an A-B student in both her core requirements as shown here. 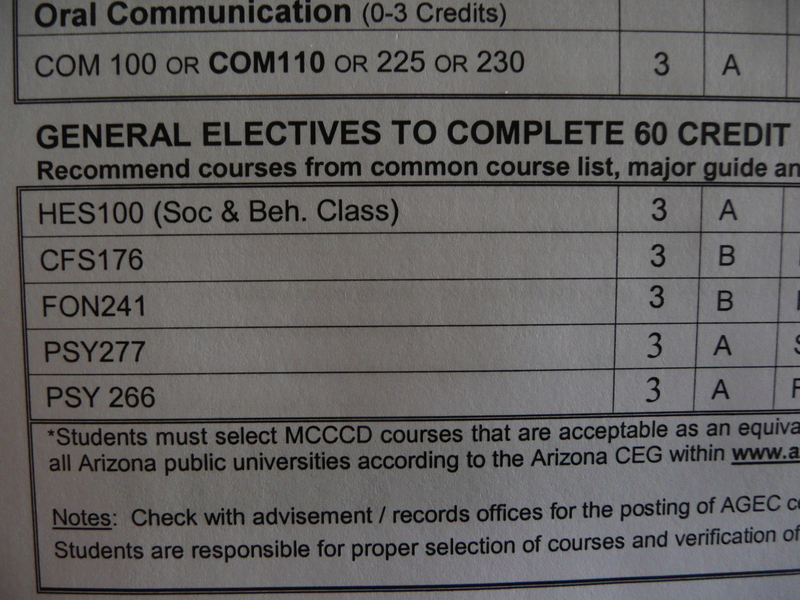 As well as in her general electives as you can see here. We are so VERY proud of Shantel and her college accomplishments. It has not been easy, but with her determination and persistence, she will be ready to move on, and follow her dream of attending Grand Canyon University, GCU next year. Shantel is already talking with GCU about the requirements for her transfer, and working with their Disability Services Department for any accommodations she will need. 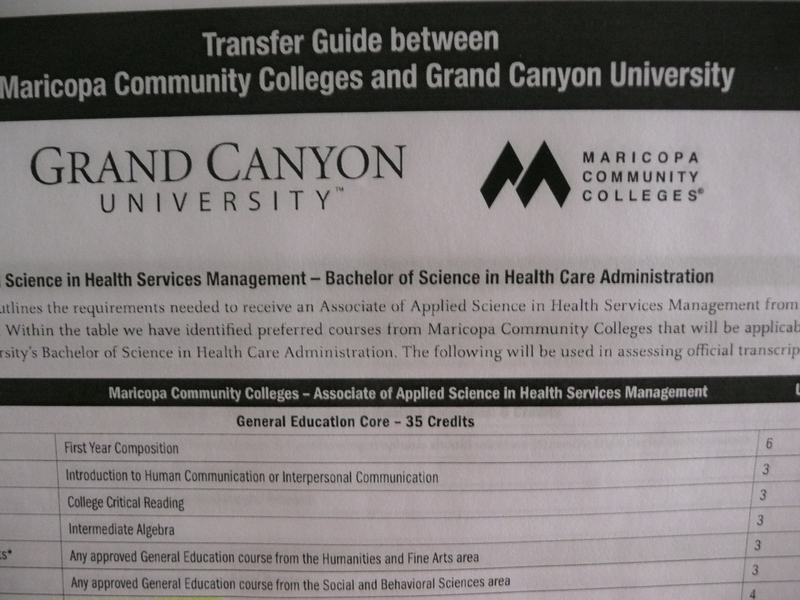 Shantel’s major is Phycology and she plans to obtain her Bachelor of Science degree in Hospital Administration At GCU. Shantel decided to attend a Community College after High School instead of going directly to a four-year University College for several reasons. One was because in order for her to go directly to a four-year University, she would have been required to take a foreign language in High School. We had so much trouble just getting English brailled for her in high school that we knew there was no way we would ever have been able to have a foreign language brailled and have the books and handouts to her in a timely manner. Another reason for Shantel’s decision to attend a Community College first was to allow Shantel time to adjust to not having an assistant in all her classes like she did in High School, and a smaller campus would allow Shantel to gain the confidence she needed to navigate from class to class without a sighted guide. It really has proven to be the best decision, as everything is falling into place quite nicely. Living in the house with an adult child is sometimes a challenge, especially if they have a disability, like our daughter, Shantel, who is totally blind. On one hand Shantel wants to be treated as an adult, and is even talking about wanting to move out on her own. She has been trying to find an apartment she can afford with a roommate, but so far that hasn’t panned out so well. More on that in a later post. Put your clothes in the hamper and not on the floor. 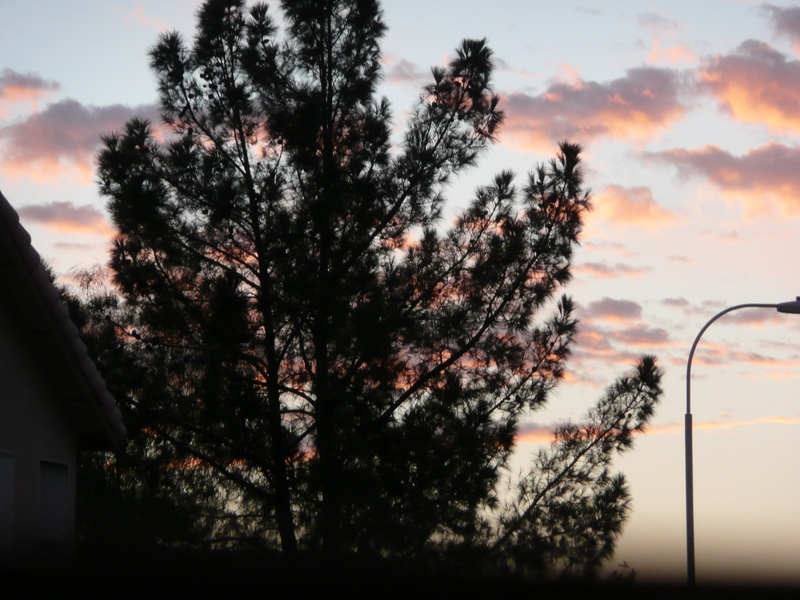 Shantel is struggling in her biology class so her instructor asked that she come to a one-on-one meeting with her every Friday from 7-8 a.m. That means an extra 40 plus mile round trip for me to drive to Phoenix. But hey, she is my daughter, and I want to help in any way I can. However, now, since we are going to be in Phoenix on Friday’s anyway, Shantel is asking me to take her to several other locations. I told Shantel I would be happy to take her to all the above mentioned places as long as she continues to keep her end of our deal and keeps her room picked up, the bathroom clean etc… She agreed and said “OK, sure, no problem” Readers, hold that thought. Yesterday, I went into Shantel’s room and found clothes all over the floor. In addition, the hall bathroom, that she uses, was a real mess with paper towels laying on the floor because she has issues putting her hand close enough to the trash can so she holds the used paper towel over the trash can and hopes it goes in when she lets the used paper towel go. She doesn’t seem to think me picking up her used paper towels is as much of a problem as it is for her to make sure she gets her trash in the trash can… her sink counter was all wet and the shower curtain was half in and half out of the tub. I was pissed to say the least. When Shantel got home from school, and got settled in, I told her about the mess in her room and in the bathroom she uses… Shantel said “oh yeah, I was going to clean all that up but I forgot.” I simply said “That’s OK, now see if you can forget about all the things you wanted me to do for you on Friday, because that deal is off.” I said “if you want me to help you, I need you to do what you agreed to do to help me too.” That is what will motivate me to want to do things for you. So we’ll see how well you can keep up your end of the deal for next week. In a previous post titled “are you sure”, I shared with you that my mother was having issues with a male resident, Ralph, at her Care Center who was running his wheelchair into the back of my mother’s wheelchair, hitting the back of her wheelchair with his fists, and being an overall bully. I addressed the matter with the head of nursing services, and the matter was brought under control. However, the very next week, my mother told me that Ralph had a medical emergency in the dinning room, was taken to the hospital, and died… I asked her if she was sure he died and she said “yes, the duty nurse, Judy, said he was already gone.” That same day, mom told me another resident, Bill, died too. So, fast forward to yesterday. Mom called to tell me my brother, Danny, came over the weekend to visit her. He comes every Sunday, but she stills feels the need to call and let me know he actually showed up… While I was talking to mom, she said “well, we finally found out what happened to that other man.” I asked what other man, and she said “you know that man who was bothering me.” I said “you mean Ralph? Yes, she said. I said “what do you mean what happened to him, you said he died?” Do you mean he’s not dead or you found out what he died from? He’s not dead, she said… Mom, why did you say Ralph was dead if you didn’t know for sure? Mom said “well, you know a lot of people around here have dementia and they don’t always know what they are saying? Yes, mom, I pretty much figured that part out already… So Ralph is alive and in the hospital, I asked? Yes, she said, and he is coming back here today. I said “oh, I know his wife will be glad to see him again don’t you think?” Well, I don’t know why she would be happy to see him, she said, he’s so damn mean. Well, mom, you just try to stay away from Ralph and perhaps he will leave you alone too. What about Bill, I asked? Bill who, she said? Bill that always sat in the corner by the nurses station. Oh, that Bill, he’s dead. Are you sure about that mom? I guess I’m as sure about that as I am anything around here. Now don’t go “blabbing” to anyone about what all happened. What do you mean what all happened mom? You know, all that happened with Ralph. I don’t want people to think we’re all crazy. Too late mom. What do you mean, who did you tell? Oh just my family and a few close friends, don’t worry about it. So you don’t care if people think your crazy she said? No mom, I gave up worrying about what people think a long time ago. It takes a lot of pressure off when you do that. You should try it sometime. At that, mom told me she had to hang up, because she had the game on and she didn’t want to miss any more of it. I said OK, mom I’ll see you on Wednesday. So, there you have it, or as much of an update as I have regarding Ralph and Bill. I do believe Ralph is alive because I don’t believe the Care Center would have just left his wife wandering around the center looking for him if he really had died. I believe they would have called the family in to spend more time with her, and for sure they would have been making funeral arrangements… However, I’m still not sure if Bill is really dead. Bill was a kind and gentle man who had been in the Care Center for many years, and I can’t imagine he would have passed and no one would even mention it. Usually when a resident passes the Care Center has a little ceremony in the garden and they release a balloon for every resident that passed that month. They also invite any other residents or visitors who knew the person that passed to attend the ceremony. I love to cook for my family, and I love to entertain family and friends. I especially love to entertain when I can make meals ahead of time that I can pop in the oven the day guests arrive. I spend a good deal of time planning menu’s, and trying new recipes. 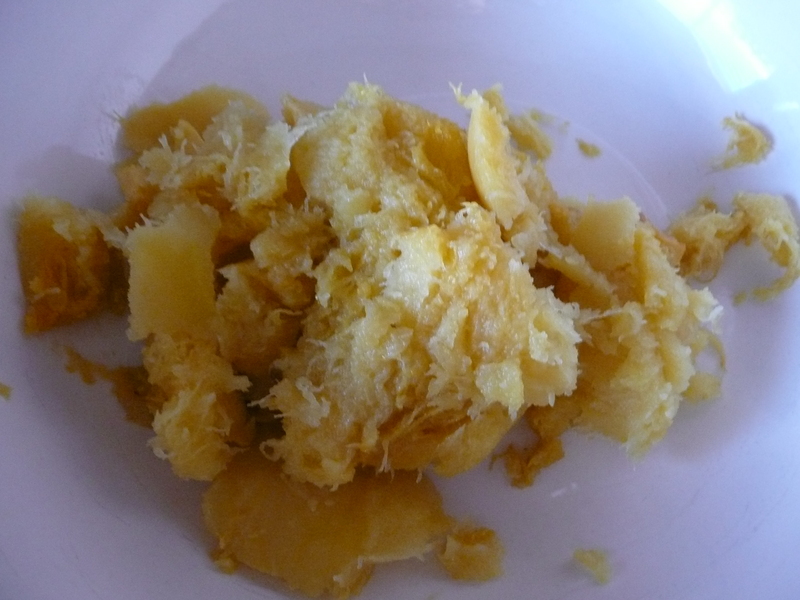 For the most part, when I try a new recipe I stick to the exact recipe the first time. 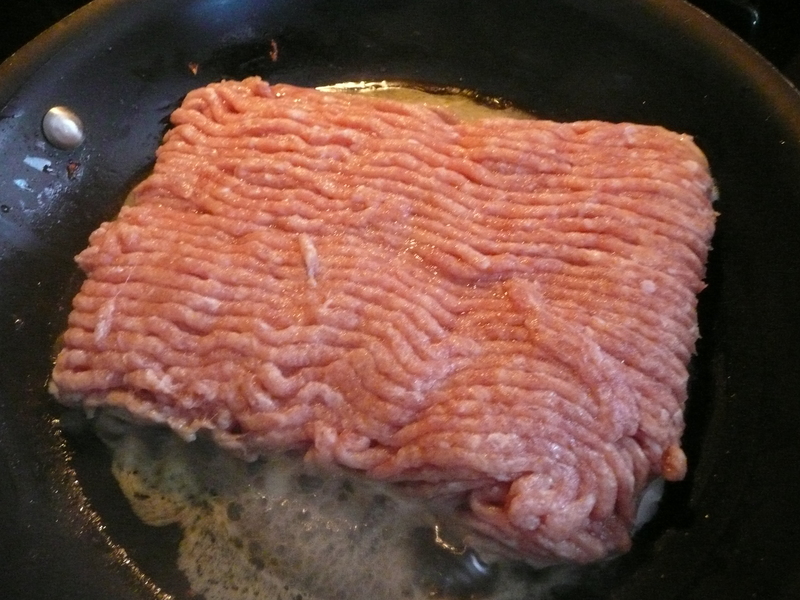 Then, after I know we like the general idea, I will change things up and make it my own version of the original recipe. I also rarely, if ever, measure ingredients. So, when I share “my” recipes, I can’t give exact measurements. 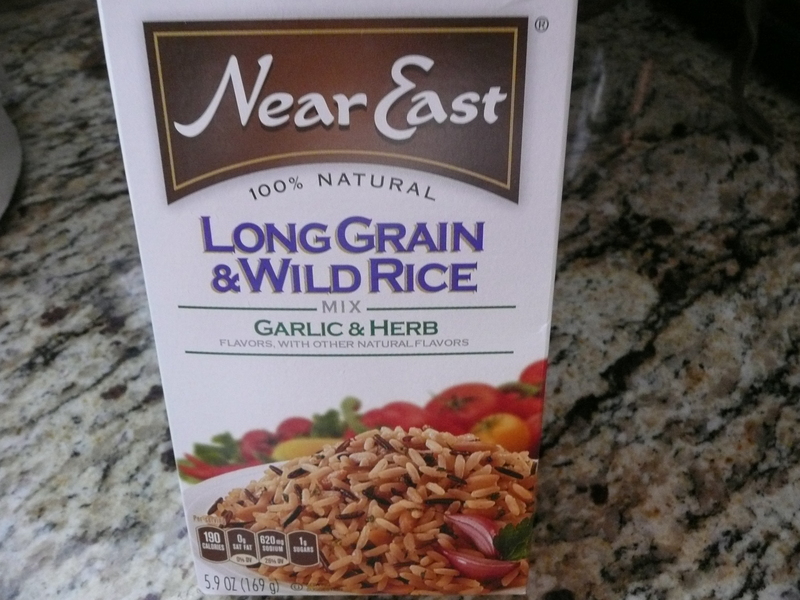 I just have to tell you, or in this case, show you how much of each ingredient to use. That’s what makes cooking fun for me. 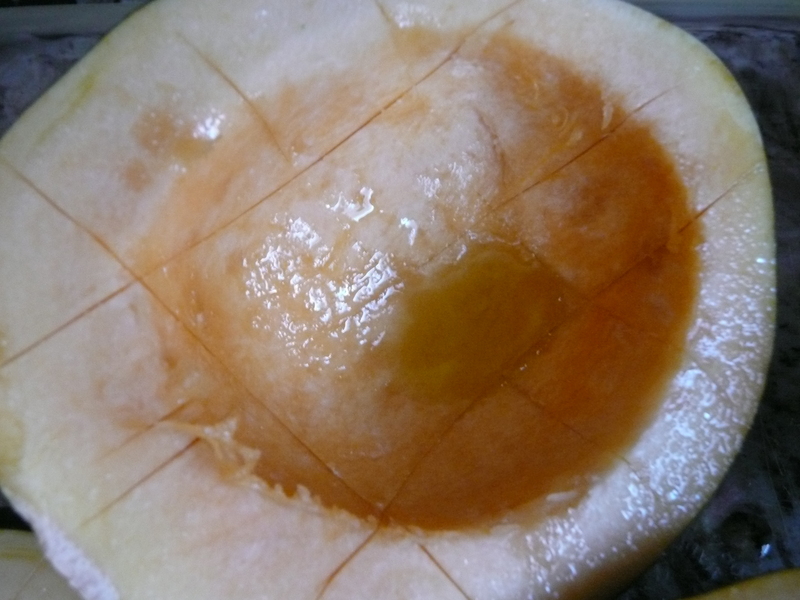 Cut cross-hash marks being careful not to cut though the skin of the squash. 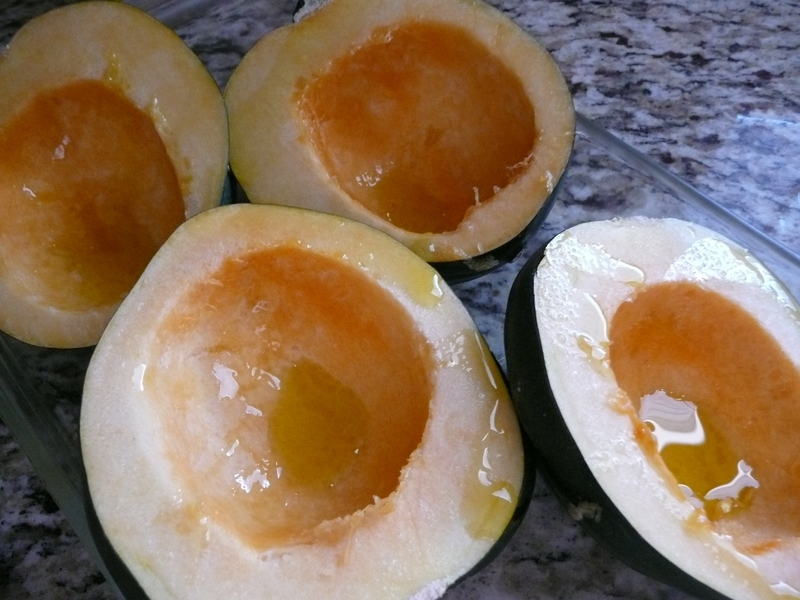 This makes it easier to scoop out the squash later. 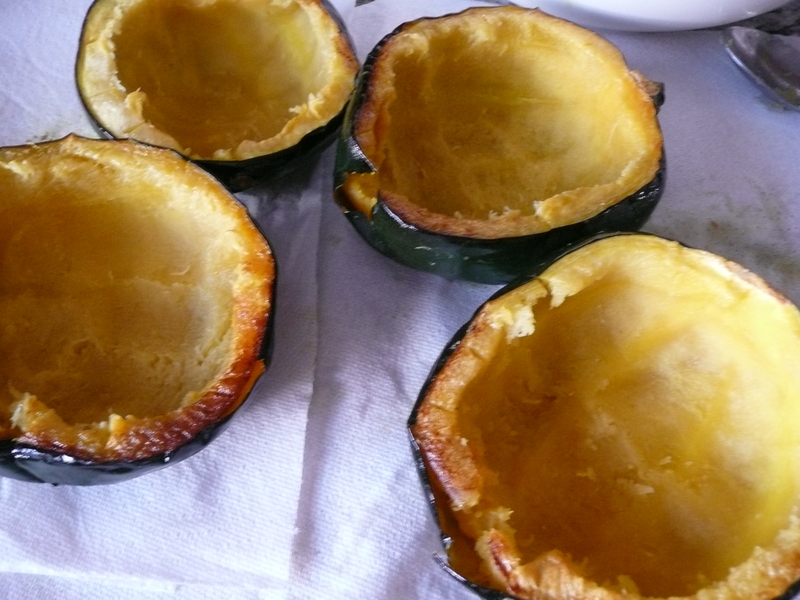 Place squash cut side down on baking dish and bake in 400 degree oven until tender enough to scoop the squash out of the shells without breaking the shell (like what you would do for twice baked potatoes..) I check the squash after 30 minutes to see how soft they are getting and adjust the timing as needed. 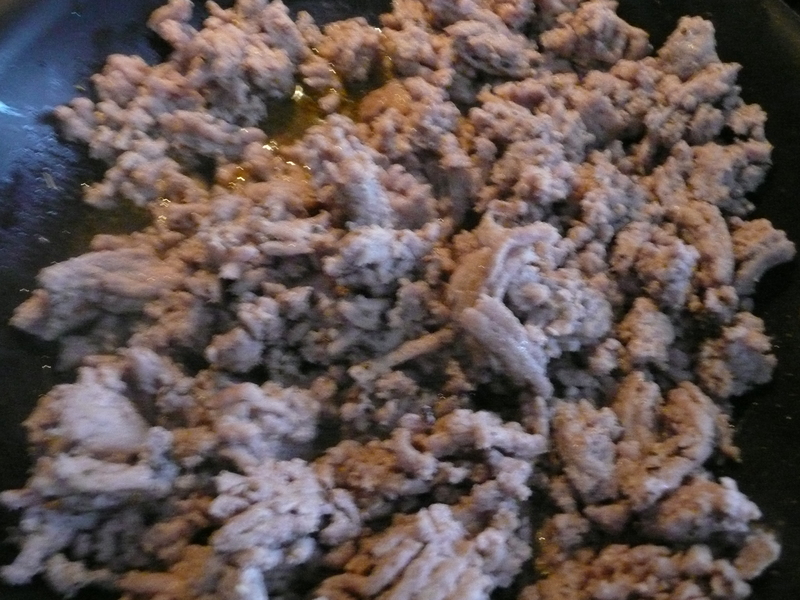 Remove meat from pan and sauté in the same pan, onions until tender, then add garlic and sage to taste and sauté a little longer but not too long or the garlic will get bitter. Add a small amount of nutmeg into the mixture. Careful, a little nutmeg goes a long way, but adds wonderful flavor. 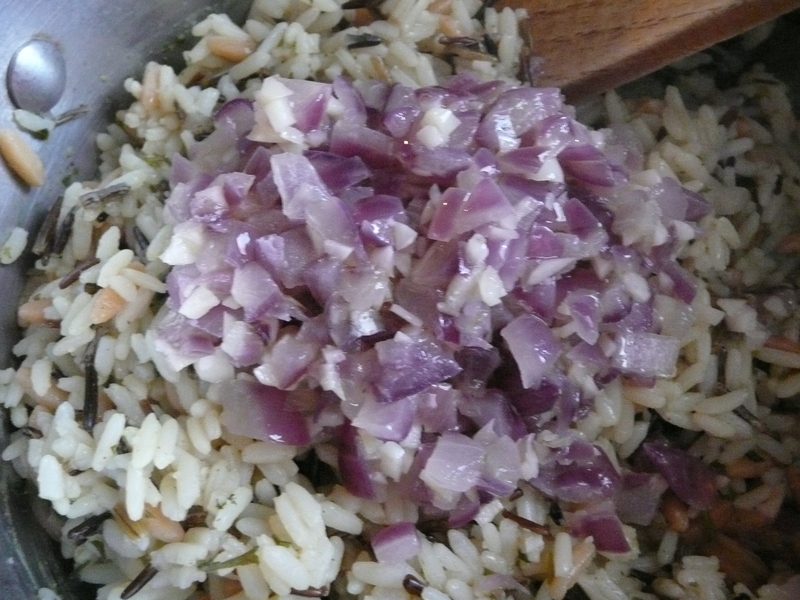 When rice is done, add onion, garlic, nutmeg & sage mixture to rice. 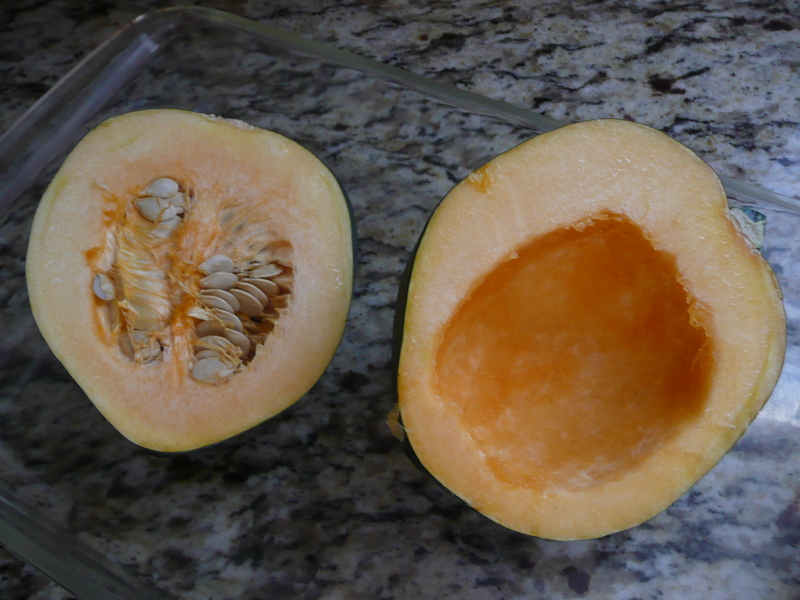 When squash is baked tender enough to scoop out the inside, remove from oven and let cool. 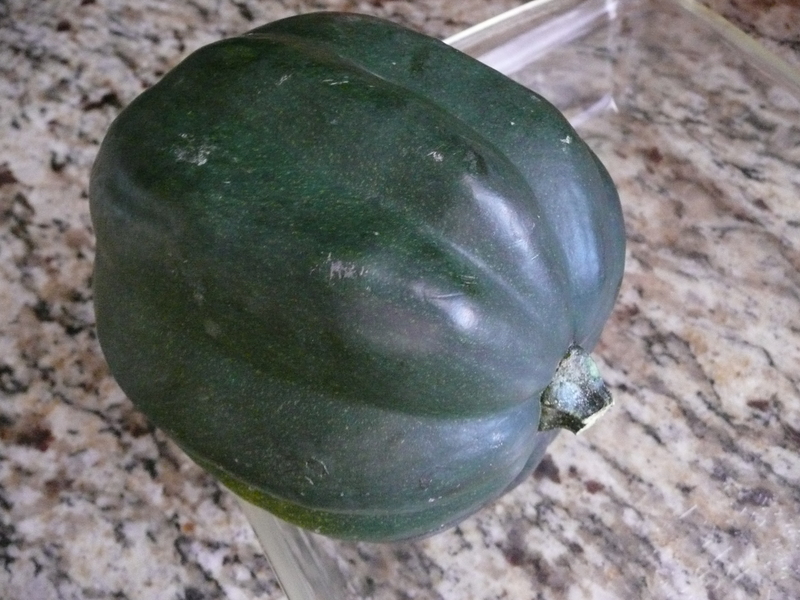 When squash are cool enough to handle, scoop out the inside of each squash leaving enough squash in the shell so they hold their shape. 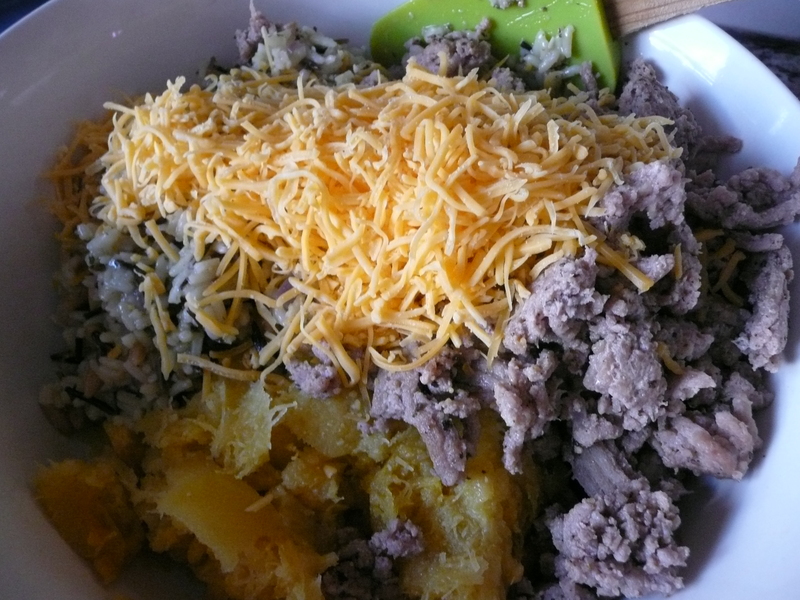 Add squash you scoped out of shells, the meat, and the rice mixture into a large mixing bowl. Add a handful of cheddar cheese and grate some fresh Parmigiano – Reggiano into the mixture and mix to blend all the ingredients well. 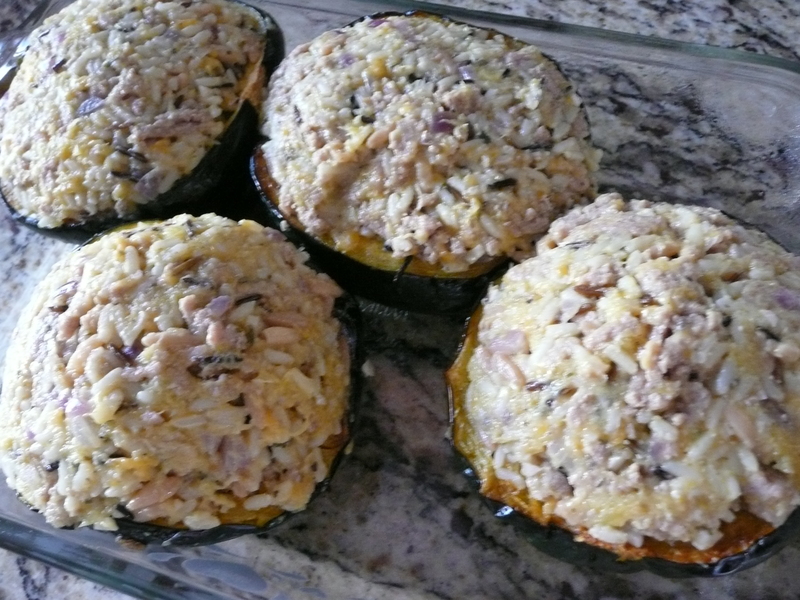 Take the empty squash shells and begin stuffing them with the meat, rice, cheese mixture and place in a baking dish that you sprayed with cooking spray. At this point you can add a little more of the cheeses on top and bake them in 350 degree oven OR cover them with foil and put in refrigerator for up to three days to bake-off at another time. 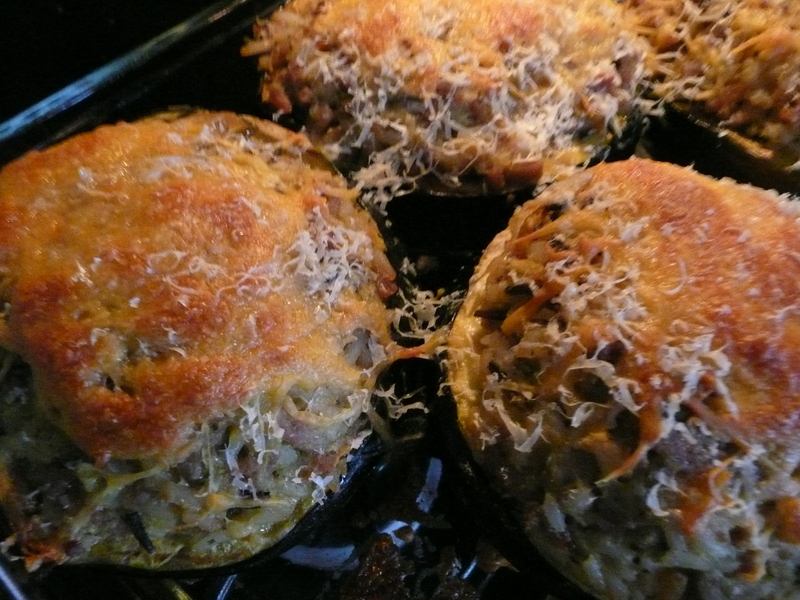 If you are making these as a make ahead meal add the cheeses on top just prior to baking. Either way…the end result is YUMMERS!!! My mother was having a problem with one of the male residents, Ralph, running his wheelchair into mom’ wheelchair, hitting the back of her wheelchair, and just being an overall bully. I made several complaints to the staff asking them to address the issue before it got out of hand. Ralph lives at the Care Center with his wife. They share a room together. Ralph’s wife is a very quiet woman and very kind. She follows her husband, Ralph, all over the Care Center all day long. Finally, after several failed attempts by the staff to get Ralph to leave mom alone, I asked to meet with the head of nursing services and filed a formal written complaint. I also told them if they didn’t get the issue resolved quickly, I was going to file a complaint with the state against the Care Center. A long story made short, the Care Center met with Ralph’s adult children, and his doctor, and they all agreed Ralph needed his medications changed which they did. They also agreed to have Ralph on a fifteen minute check routine which means a staff member would check on him every fifteen minutes throughout the day when Ralph was out of his room. Things went along real well and mom didn’t complain to me that Ralph was bothering her anymore as of my last visit which was this past Monday. I love to take long walks. In fact, walking is my daily exercise routine of choice. I believe walking is truly the best all around exercise we can do. I’m not talking about a leisurely stroll, No, I’m talking about walking fast, getting your heart rate up, and keeping it up for an extended period of time. I usually walk for 45-60 minutes. I make it my top priority of the day so I won’t get distracted by my other daily activities and forget about the most important activity which is to stay healthy. Once you have a good pair of walking shoes, it doesn’t cost anything to walk. Walking is easy on the joints and you can change your routes so it doesn’t become boring. 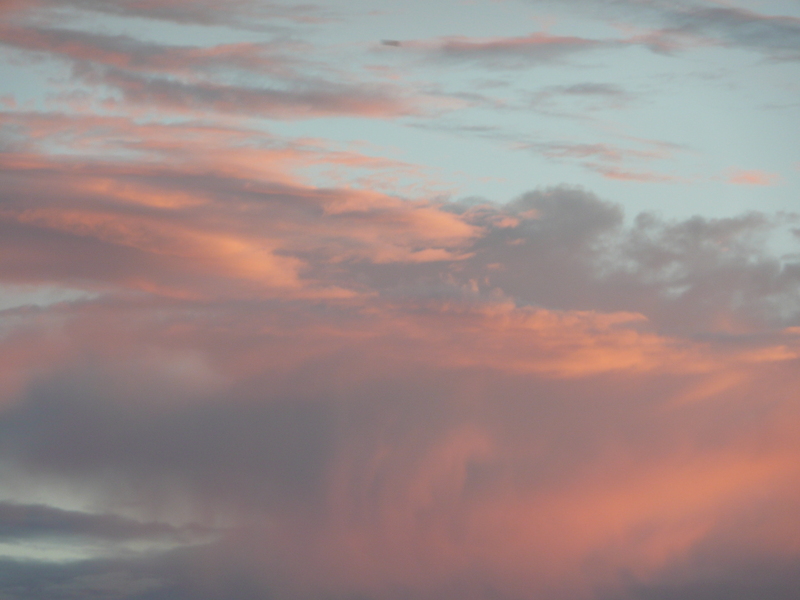 Other times, like when I get to see this, I simply meditate on the beauty and wonder of it all, and give thanks for another beautiful day. I can’t think of a better way to release stress, set your mood, and start your day? 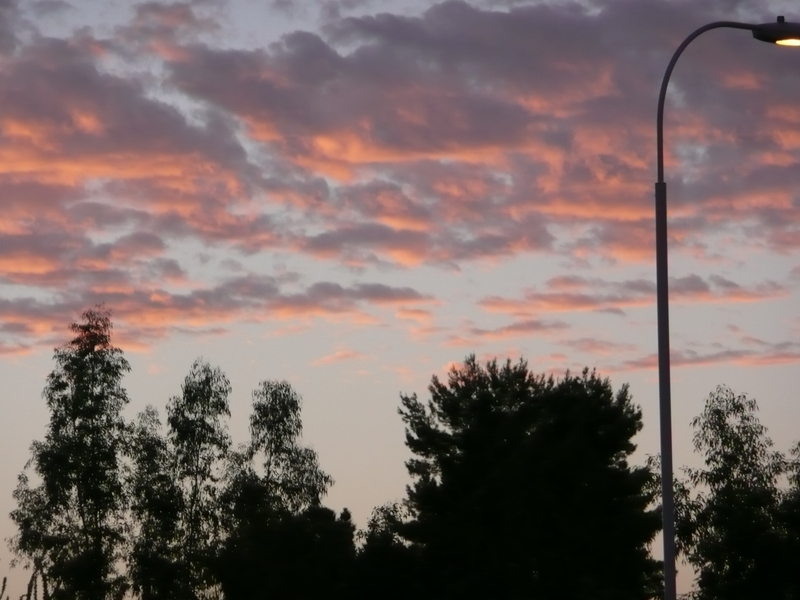 For me, no other exercise measures up to walking at sunrise in Arizona. I don’t like carpet. Not even in the bedrooms. In our old house, in Ahawtukee, we had all the carpet taken out and the entire house tiled. I loved it. Easy to clean, don’t have to worry about things getting spilled on it, because it can just be wiped up without staining etc. 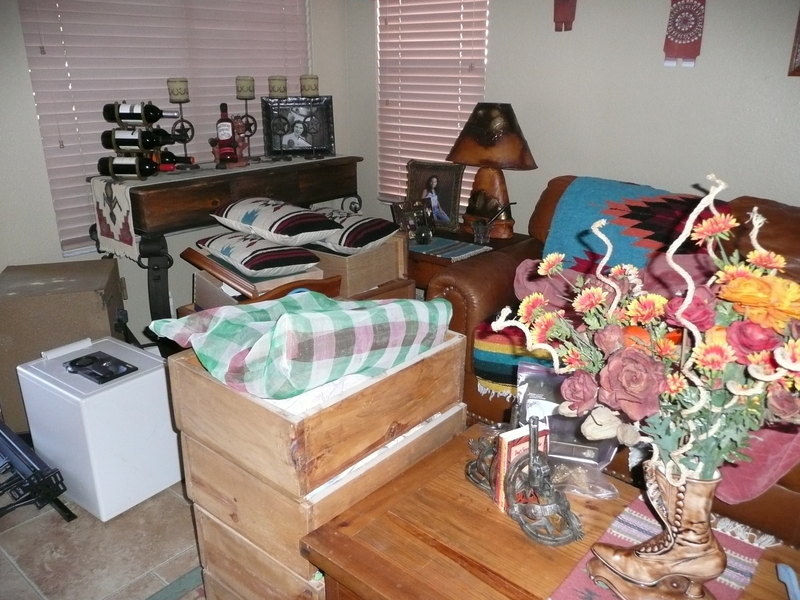 When we moved into our home here in Chandler, the whole house had just been remodeled, and has travertine tile throughout the house, except for the three bedrooms, which had berber carpet. I thought if I had to have carpet I would like berber carpet so we went with it. 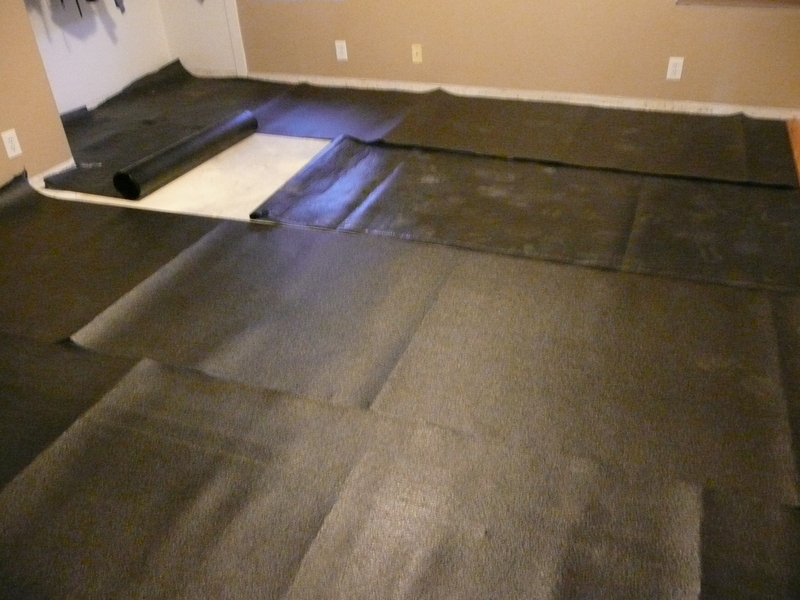 As time went on I came to hate the carpet, and started thinking of saving up to have it removed and replaced with tile. This past week, as I was taking my daughter, Shantel, apartment hunting, I noticed many of the apartments had beautiful, laminate wood floors throughout the apartments, and I loved the way it looked. 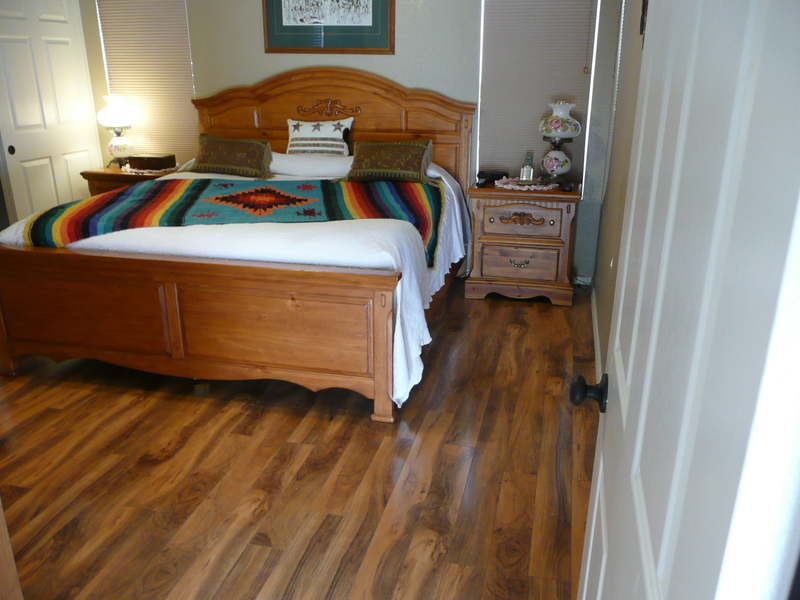 So, I started thinking, I would love to replace the carpet in the bedrooms with a real rustic looking laminate wood. Well guess what happened…? The very next day I saw a commercial for Empire Flooring and they were having a 50% off sale. It was like it was just meant to be… So, we made an appointment with Empire. The sales person came right to our home and showed us a huge selection of tile, hardwood, and laminate wood flooring. 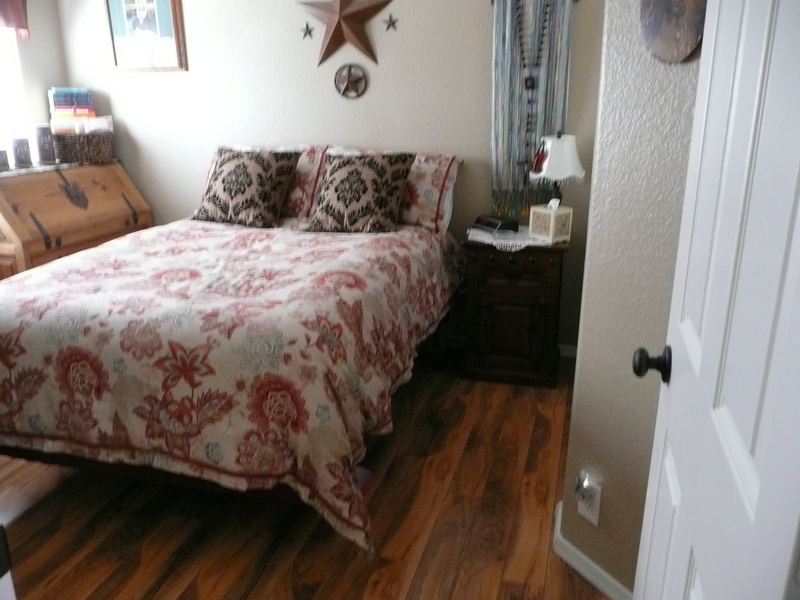 I fell in love with a very rustic looking laminate wood and my husband, Bill, loved it too. 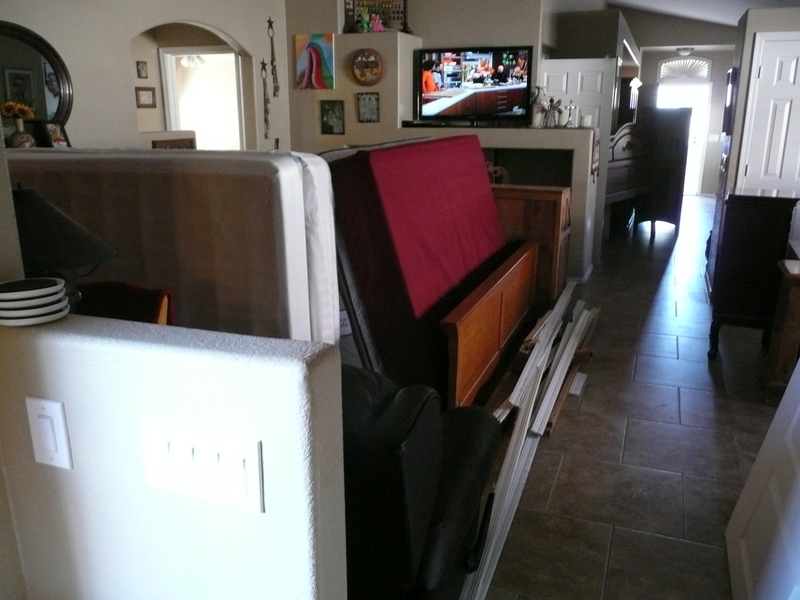 First, everything had to be disassembled so the installers could move the furniture out of the bedrooms. 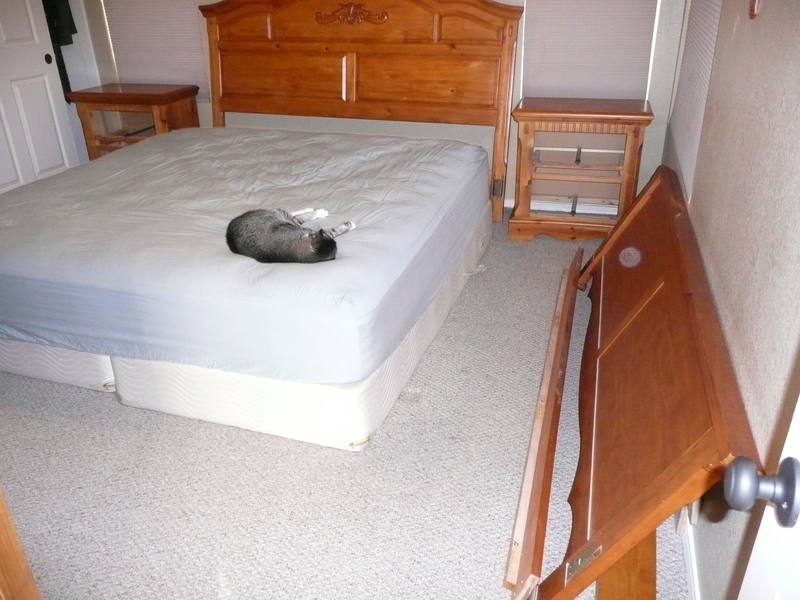 We started with the master bedroom, but our kitty, Carmen wasn’t ready be moved. 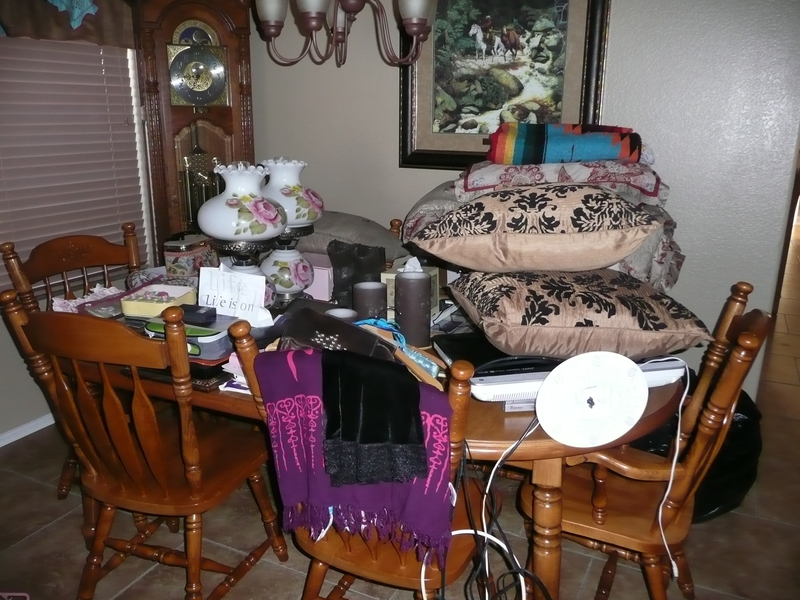 And living room, What a mess!!! 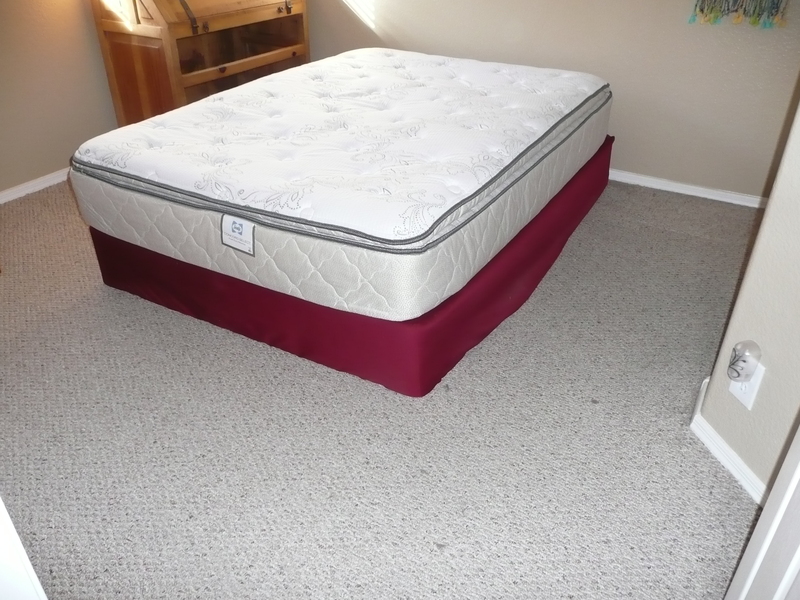 Once the bedrooms were all cleared out, the carpet, padding, and baseboards were removed, and the laminate padding was cut and laid out.